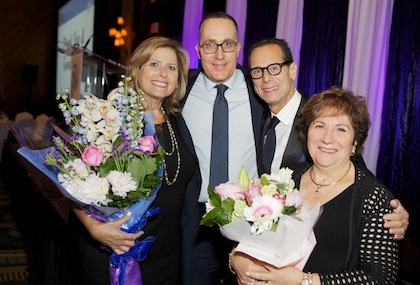 Vancouver supporters of the Jewish National Fund (JNF) gathered in their finery at the Four Seasons Hotel Vancouver on June 3 to celebrate Israel’s 70th birthday and pay tribute to philanthropists Neil and Michelle Pollock. Michelle Pollock is a former lawyer, the immediate past president of the board of the Jewish Community Centre of Greater Vancouver, and has co-chaired the Jewish Federation of Greater Vancouver annual campaign’s women’s division for six years, as well as supporting Jewish education, among many other causes. Dr. Neil Pollock is chief surgeon and medical director of Pollock Clinics. He has undertaken teaching missions to Rwanda, Congo and Haiti, as well as being involved in philanthropy at home and abroad. JNF Pacific Region president David Goldman welcomed the crowd – who had to pass a few dozen protesters on their way into the hotel – and introduced the evening’s emcee, Michael Nemirow, a friend of the Pollocks, who is also involved in various community organizations and activities. 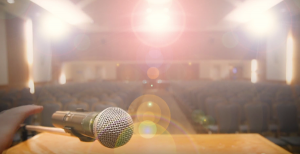 “I’ve done the math, and we have around 11 hours of speeches and entertainment for you this evening, but we’ll try to compress it into three,” Nemirow said, eliciting laughter from the crowd. After Maurice Moses led the audience in O Canada and Hatikvah, B.C. Lt.-Gov. Janet Austin took the stage. She praised JNF for its work in the “restoration and preservation of the Jewish homeland,” which covers everything from ecological to social to security initiatives. Austin also commented about the Pollocks, highlighting Neil Pollock’s work in Rwanda to prevent the spread of HIV. Galit Baram, consul general of Israel for Toronto and Western Canada, focused her remarks on the 70th anniversary of Israel, “the only democracy in our region, a bastion of democracy.” She described its strengths in the areas of human rights, medicine, multiculturalism and technological innovation. She said Israel is led by people “both on the right and on the left who love their country with all their hearts” in the face of multiple existential threats. “We rely on our friends who share common values, and Canada, our ally, is among them,” she said. “The success of Israel did not happen in a vacuum,” said Baram, citing JNF as a key organization in supporting the state, one in whose name every Israeli has a tree planted. She also spoke of JNF’s contributions in a multitude of activities, including supporting soldiers with post-traumatic stress disorder and her “personal favourite,” the building of a protected playground in Sderot in an area that has suffered shelling from Hamas and other militant groups. 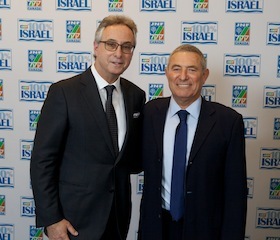 Baram thanked Canadians for the warm welcome and open arms with which Israeli diplomats are welcomed in the country. 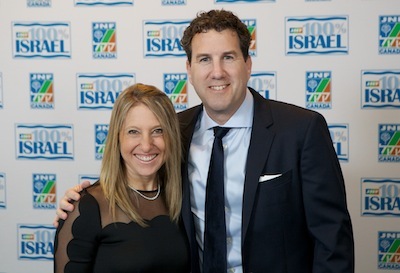 After Hamotzi, chanted by the Kollel’s Rabbi Avraham Feigelstock, Ilene-Jo Bellas, former president of the JNF Pacific Region (2012-2015), was presented with the JNF Bloomfield Award by local shaliach Ilan Pilo. He described Bellas as an indefatigable servant for Israel who “bled blue and white,” a portrayal she affirmed as fact after taking the podium. Rabbi Dan Moskovitz then led everyone in Birkat Hamazon, before Vancouver TheatreSports performed a series of improv skits centred on the Pollocks’ life as a married couple. The keynote speaker of the dinner was Doron Almog, a former major general in the Israel Defence Forces, who received the Israel Prize for lifetime of achievement. 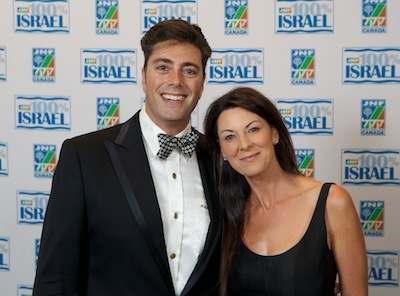 He discussed his role as founder of ALEH, the charity for children with developmental disabilities that the Pollocks chose to support with monies raised from the evening. Almog spoke on the theme of commitment, as experienced throughout his life and in the work he has done for children. He shared the story of the death of his brother, a tank operator who died after being injured, left behind by his fellow IDF soldiers. Almog subsequently swore to never leave behind an injured soldier. Almog’s son Eran, who was named after his fallen uncle, was born with a combination of autism and developmental problems, and a psychiatrist told the family that he would probably never speak, remaining at the cognitive age of an infant. “This son became the greatest teacher of my life, he taught me more than anyone about life, about commitment,” said Almog. ALEH Jerusalem, a multi-service home for children with disabilities, now receives help from more than 450 volunteers from all over the world. Some of them, said Almog, are children of Nazis, who say they are coming as atonement for Hitler’s decision to kill people with disabilities. “The social chain is always measured by its weakest link,” said Almog, receiving a standing ovation. After a video explaining more about ALEH, there was a video tribute to the Pollocks introduced by their children, Josh, Elliot and Shoshana. The Pollocks said a few words, after which Goldman and Pilo wound up the celebration.